Mohammad Reza Hedyat was arrested at an anti-racist demonstration in Toronto in January 2011. He was given trumped-up charges including aggravated assault and while in police custody was beaten and hospitalized. He has been on strict bail conditions including house arrest since, and has had his Canadian citizenship process suspended. If convicted, Mohammad is facing possible deportation to Iran. 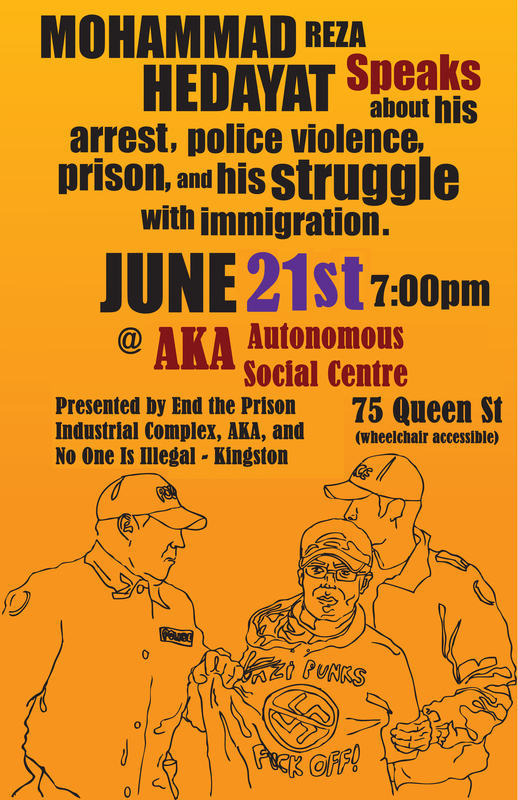 On June 21st at AKA, Mohammad speaks about his arrest, police violence, prison, and his struggles with the immigration system to garner support before his trial commences on July 4th. This entry was posted in Events, Repression. Bookmark the permalink.